Risky assets continue to push higher, with global and US conditions still strong despite the recent softer data. Despite various geopolitical events surfacing, equity markets continue to trudge upward. Meanwhile, defensive assets have also performed well in contrast to the historical norm. Australia’s S&P/ASX 200 is close to breaching the 6,000-point mark despite some pullback from materials following falls in the iron ore price of over 20% to $75, primarily lead by the all-important financial sector. Meanwhile, commodities have fallen along with iron ore prices as Chinese monetary tightening starts to flow through. The Australian Dollar has also fallen slightly to 75 US cents. Australia’s economy continues to muddle along off the back of stronger growth elsewhere. Retail spending and consumer sentiment remain weak as Australians continue to commit large amounts of their incomes to mortgage repayments. Meanwhile, housing prices continue to rise strongly despite further APRA measures. The RBA continues to hold rates on the back of this and delivered a more sombre outlook than last months in an effort to balance expectations. The rest of the world continues to post solid economic data, with Europe a bright spot as employment and wages pick up along with other broader economic indicators. The US also posted a slightly stronger than expected GDP growth of 2.1% for 2016. There was some softness in US employment and vehicle sales data, but this was largely attributed to one-off events such as poor weather affecting construction employment. Chinese data was also robust despite continued monetary tightening by the government. Producer inflation continues to be high after years of weakness, meaning that China is now exporting inflation to the rest of the world which should help boost inflation prospects in the US, Europe and Japan. The US earnings season kicks off and continues to be a huge event for investment markets. With contrasting signals coming from the risky and defensive markets, it will be an important indicator of whether the bulls or the bears are correct. Earnings growth expectations have been revised higher, driving equity markets up, while geopolitical risks and valuation concerns (last month’s Monthly Perspective discussed this issue) have been the driver for defensive markets. Equity markets have risen strongly this year, with risk-on sentiment being a standout. Emerging markets, generally thought to be the riskier part of equity markets, was the best performer in the first quarter. For much of the first quarter, the fixed interest markets exhibited the same risk-on sentiment as investment grade yields rose while high-yield, sub-investment grade yields fell. 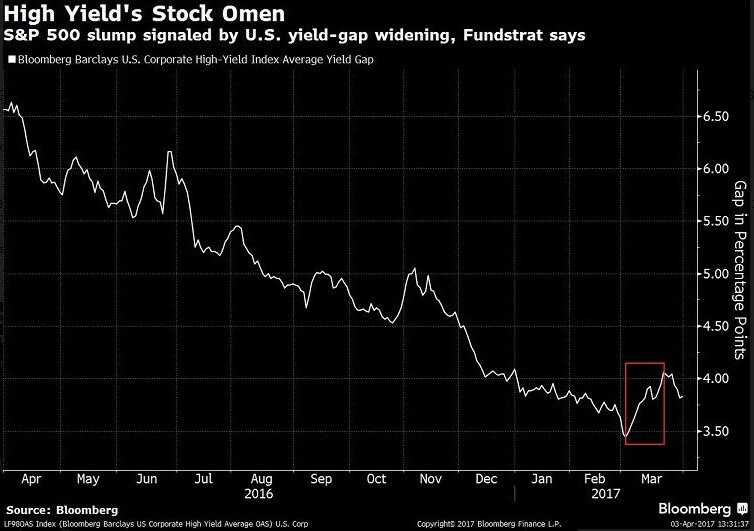 This resulted in the spread between the two yields compressed – a common occurrence and strong indicator of positive risk sentiment. This all changed in March as the fixed interest markets saw the risk-on sentiment fade quickly. Investment grade yields fell while sub-investment grade yields rose as fixed interest investors pared back their optimism amid growing concerns primarily around geopolitical risks arising such as escalating North Korean and Russian tensions. This led to widening yield spreads as per the chart below. Meanwhile, the equity markets seemed to ignore the fixed interest markets and continued to push higher. Historically, such occurrences are not uncommon and contrasting views between the markets can last for extended periods, though eventually one of the markets will be proven to be right, and the other will adjust accordingly. The fixed interest market tends to be the right one, meaning we are more likely to see some sort of pull-back in the markets, though the level by which the yield spread has widened is modest. Unless spreads widen further, the fixed interest market looks to be indicating that risk-on sentiment could just be taking a breather. If the risk-on sentiment does give way to pessimism, the best chance of outperformance lies in active management, especially for equities. While there is an age-old argument between passive and active management, the best active managers outperform the most during periods of negative returns. Generally, these primarily try to limit the downside capture (the negative return achieved by the fund versus the negative return achieved by the index), meaning that they primarily try to lose less money than the index when the market falls. Most of the best actively managed funds manage to record long-term outperformance by achieving strong results when it comes to limiting downside capture. Meanwhile, they generally struggle to consistently outperform during up markets. A major factor in this is that the dispersion of equity returns tends to be low during market rallies and the chart below shows that equity dispersions are on the rise. Passive or index funds are unable to take advantage of these dispersions but this is when active managers really start to show their worth. 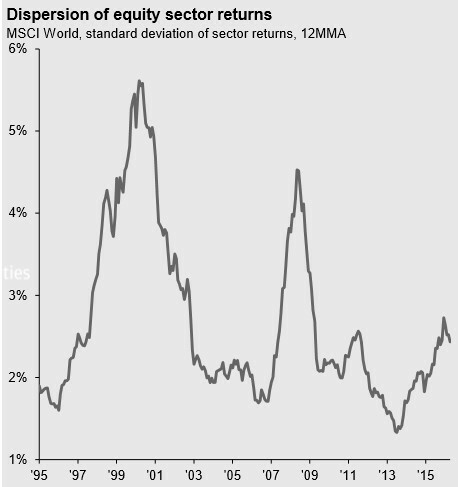 Dispersion tends to start rising towards the end of bull markets when euphoria starts to set in. In the lead up to, and subsequent ‘tech-wreck’ period, the dispersion can be primarily attributed to tech stocks which rose much more than other sectors of the market before falling off a cliff. A similar situation occurred with financials and real estate in the period surrounding the Global Financial Crisis. Whilst the age-old argument between whether passive or active management is better in the long run is likely to continue with neither side giving ground, there is strong support that good active managers tend to outperform in falling markets. However, consistently predicting when equity markets fall is an entirely different beast. If it was possible, moving to assets that would profit during downturns would be the better option but for those who do not have access to a crystal ball or are unable to travel through time, all we can aim for is to limit downside capture.